Last month we had 2 full moons during the month. This is a fairly common phenomenon, knowing that the moon has a cycle of 27.5 days and months are in general 30.5 days. A double full moon will so happen every 2.5 years in general. They can happen in any month, except February. Here is a picture of the second full moon of December 2009. Also the last one, it occurred at 7:23PM here in Winnipeg. 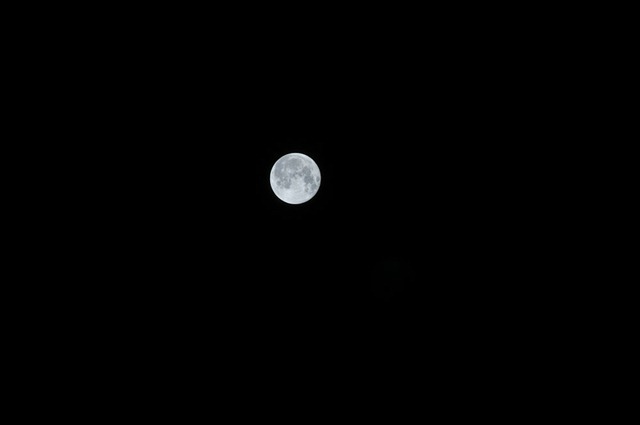 Now this does not look much like a picture, but taking shots of the full moon is not as simple as it looks. If we let our cameras do the work, after all we bought them to be intelligent, then we end up with pictures that overexpose the moon. Leaving only a white dot or circle to contemplate. Even if we try to use spot metering (good choice) then it’s close, but no cigar… The spot in our cameras is about 5 times the size of the full moon and so will still meter too much darkness. Now let’s try something else. Set the camera to Manual and use a diaphragm of f/11. Set your ISO to 100, shutter speed to 1/100sec and focus. Sometimes the auto-focus will work, better to believe your own eyes here. Now, you will say: “I don’t have 100 ISO on my camera, it starts at 200.” Ok, then use ISO 200 and a shutter speed of 1/200. Same result. Now press the shutter. Voila! 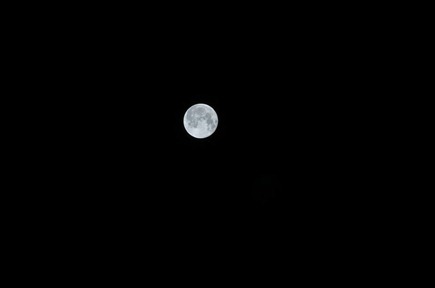 You have a clear picture of the full moon. Now if you want to do the same with half moon or New moon, you will have to adjust your settings a bit but the principle remains the same. The principle is called the Moony 11, and is a little brother of the old Sunny 16 rule.